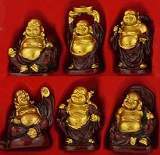 A set of 6 Happy Buddha figurines in shiny gold and rosewood finish. There is one for Safe Travel, Prosperity, Love, Spiritual Journey, Happy Home, and Long Life. High gloss faux gold finish statues of solid stone resin. 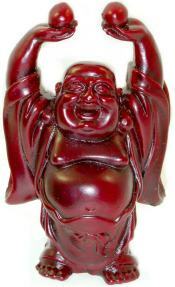 A set of 6 Happy Buddha figurines in shiny rosewood finish. There is one for Safe Travel, Prosperity, Love, Spiritual Journey, Happy Home, and Long Life. High gloss faux Rosewood finish statues of solid stone resin. 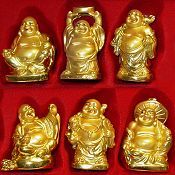 A set of 6 Happy Buddha figurines in shiny gold finish. There is one for Safe Travel, Prosperity, Love, Spiritual Journey, Happy Home, and Long Life. High gloss faux gold finish statues of solid stone resin. 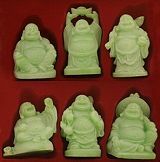 A set of 6 Happy Buddha figurines in translucent Faux green jade finish. There is one for Safe Travel, Prosperity, Love, Spiritual Journey, Happy Home, and Long Life. High gloss faux Jade finish statues of solid stone resin. A set of 6 Happy Buddha figurines in neon purple, glow in the dark finish. There is one for Safe Travel, Prosperity, Love, Spiritual Journey, Happy Home, and Long Life. High gloss faux gold finish statues of solid stone resin. Statues need exposure to daylight to glow in the dark. A set of 6 Happy Buddha's in hand painted shiny faux gold plated finish. There is one for Safe Travel, Prosperity, Love, Spiritual Journey, Happy Home, and Long Life. A Feng Shui bad luck cure, place one in every room in the corner opposite the entrance. Colorful high gloss gold garments and pearled skin finish with painted faces on solid cast resin statue. A set of 6 Happy Buddha's in six different colors! There is one for Safe Travel, Prosperity, Love, Spiritual Journey, Happy Home, and Long Life. A Feng Shui bad luck cure, place one in every room in the corner opposite the entrance. Colorful high gloss finish Buddha statues in solid cold cast resin. 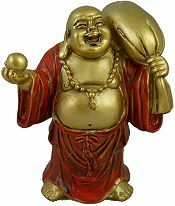 Prosperity Laughing Buddha figurine carries a large money bag (which never empties) with his right hand and and in his left hand are prayer beads for devotionals. He brings success and prosperity according to Feng Shui lore. Place where you pay bills or in the Wealth Corner, the far left corner from the entrance of a home or building for maximum wealth cure effect. 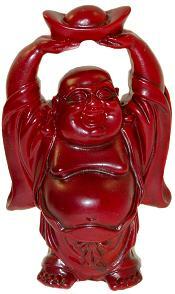 Antique red and gold satin finish solid cast resin Buddha statue. Ho Tai is the deity of happiness, laughter, abundance, wisdom and contentment. 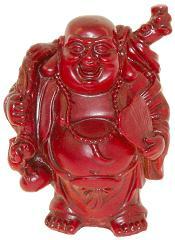 This aged red and gold finish smiling Happy Buddha figurine has elongated earlobes for wisdom, a large round belly that symbolizes happiness, good luck, and generosity. The Buddha holds a gold ingot (Yuen Bao) in his right hand for wealth. 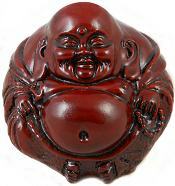 It is said that rubbing his belly will bring good fortune and joy. Antique red and gold satin finish solid cast resin Buddha statue. 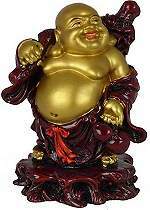 Bringing prosperity the Good Fortune Happy Buddha figurine sits on a bottomless money or travel bag said to carry special gifts for all. He holds an >auspicious gold Ruyi Scepter to discern right choices for a happy life His gifts are given freely, his purity brings detachment from the daily ills of the present and the past. 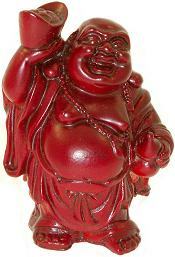 Antique red and gold satin finish solid cast resin Buddha statue. 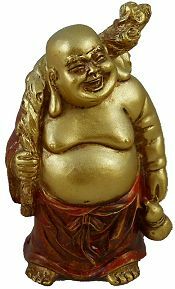 Fortune and Happiness Laughing Buddha figurine carries a large money bag (which never empties) with his left hand and holds a gold Pearl of Wisdom in his right hand for right thinking. 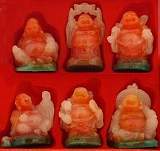 He brings success and prosperity according to Feng Shui lore. Place where you pay bills or in the Wealth Corner, the far left corner from the entrance of a home or building for maximum wealth cure effect. Antique red and gold satin finish solid cast resin Buddha statue. This Hands Up Laughing Buddha figurine celebrates the joy and satisfaction that springs from the daily devotion to life, home and family. His simplicity reminds us what is important in life. Place in a family gathering area in a far left corner from the entrance of a home. Antique red and gold satin finish solid cast resin Buddha statue. New beginnings Laughing Buddha carries the travel bag which never empties, hung on the Buddha's Yoke in his right hand and a water gourd for purity in his left hand. His purity brings protection and his detachment ushers a new beginning breaking from the bad luck of the past. Antique red and gold satin finish solid cast resin Buddha statue. 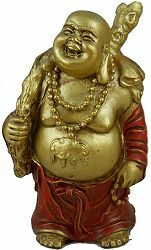 This Laughing Buddha figurine carries a gold sack and offering bowl on his travels. 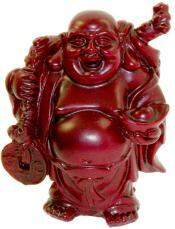 He brings success and prosperity according to Feng Shui lore. Place facing your front door. Hong Tze statue made of stone resin with a highly polished Rosewood finish. New beginnings Laughing Buddha carries the travel bag which never empties, hung on the Buddha's Yoke in his right hand and a water gourd for purity in his left hand. His purity brings protection and his detachment ushers a new beginning breaking from the ills of the past. High quality Hong Tze statue made of stone resin with a beautiful satin Rosewood finish. This Hands Up Laughing Buddha figurine carries a gold ingot (Yuen Bao) above his head or it can be considered a rice bowl offering. 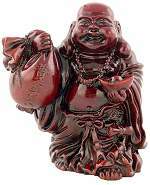 He brings success and prosperity according to Feng Shui lore, best placed inside the front door facing the living area to direct wealth and prosperity into your home. High quality Hong Tze statue made of stone resin with a beautiful satin Rosewood finish. Prosperity Laughing Buddha figurine carries a large money bag (which never empties) strung with a large gold coin with his right hand and a large gold ingot (Yuen Bao in his left hand. He brings success and prosperity according to Feng Shui lore. Place where you pay bills or in the Wealth Corner, the far left corner from the entrance of a home or building for maximum wealth cure effect. High quality Hong Tze statue made of stone resin with a beautiful satin Rosewood finish. This Hands Up Laughing Buddha figurine has nothing other than rice balls with which he celebrates the joy and satisfaction that springs from the daily devotion to home and family. His simplicity reminds us what is important in life. Place in a family gathering area in a far left corner from the entrance of a home. High quality Hong Tze statue made of stone resin with a beautiful satin Rosewood finish. Spiritual Journey Laughing Buddha figurine carries the travel bag strung on Buddha's Yoke with gifts for all and in his left hand an Oogi Fan which grants spiritual favors. He is an inspiration for those seeking spiritual growth and wisdom moving toward new hidden truths and leaving attachments to the past. Place on altar or place of meditation. High quality Hong Tze statue made of stone resin with a beautiful satin Rosewood finish. Selfless Laughing Buddha carries a huge gold ingot (Yuen Bao) in his right hand or it can be considered a rice bowl offering and a water gourd for purity in his left hand. His offering is a gift freely given, his purity brings detachment from the daily ills of today and the past. High quality Hong Tze statue made of stone resin with a beautiful satin Rosewood finish. The wisdom of the ages rests with the Buddha. 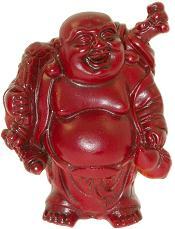 Add this traditional round Hotai Laughing Buddha figurine with prayer beads to your collection. Hong Tze figurine made of stone resin with a polished Rosewood finish. This Laughing Hotai Buddha statue carries the traditional knapsack, water gourd and fan as he seeks out the hidden truths of Life. He brings success and prosperity according to Feng Shui lore. Place facing your front door. Made of stone resin with a highly polished Rosewood and painted Gold finish. A Happy Buddha holds a gold ingot and sits on a life sized gold ingot. The Buddha with gold ingot has been an ancient Feng Shui cure to promote wealth and prosperity. Stone resin figurine with a satin Antique Gold finish. A set of 6 Happy Buddha figurines in neon green, glow in the dark finish. There is one for Safe Travel, Prosperity, Love, Spiritual Journey, Happy Home, and Long Life. High gloss faux gold finish statues of solid stone resin. Statues need exposure to daylight to glow in the dark. Available in Neon Green or Neon Purple. 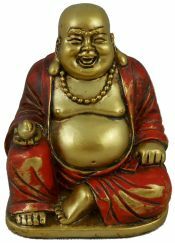 This Laughing Buddha figurine carries a gold sack and offering bowl on his travels. He brings success and prosperity according to Feng Shui lore. Place facing your front door. Made of stone resin with a highly polished Antique Gold finish.